Bjorn is a fully animated pod puppet in a similar style to our Creatures. A highly skilled (and often very hot!) performer is inside operating all the movements including the facial animations - blinking eyes, sniffing nose, opening mouth and also the live sounds from our custom built sound equiptment. 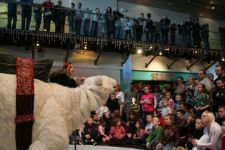 The keeper character is dressed in an Inuit style outfit to compliment the arctic theme, and acts as an intermediary between the audience and the Polar Bear, distributing interesting facts and related chat. To help set the scene we have a specially built inflatable ice environment in which we perform. Our Top Polar Bear facts to impress your friends with - All Polar Bears are Capricorns & did you know, Arctic means 'with bears' and 'Antarctic' means without bears! The show actually involves REAL science & has been performed at events such as BT Young Scientist of the Year, Cambridge Science Week, W5 Science Centre & World Oceans Day at Galway Aquarium. What people are saying about Bjorn - Amazing, Incredible, is it real? It IS real! Beautiful, lovely. Can I take him home? "He's beautiful, can I kiss him?" Eva Green (Casino Royal/Golden Compass).